Once inside the airport at Gatwick, we made our way to customs. I started towards one lane and then realised it was the “assisted lane” so I began moving away when one of the security guards allowed us to go through, because they weren’t busy at that stage. However, by the time they had finished with me, there was a decent queue. We had to place our liquids and pastes in a little plastic bag outside our hand luggage, of course with nothing greater than 100mls, but I forgot to take my watch off because I was busy remembering to take my belt off. Naturally the metal detector doorway beeped. Maybe we had been too chatty and therefore suspicious, because the female security guard gave me the once over, very thoroughly I might add. One centimetre more and it would have been a cavity search! The weight of our luggage was just over the allowance for check-in baggage, at 23.1 kg and 23.2 kg, but our cabin bags, not including the laptop bag (thank goodness) or my handbag, weighed 5.7 and 6.0 kg, just under the 7 kg limit. On this aeroplane, flight BA2037, the individual movie screens were much clearer and the sound much better than on Malaysian Airlines. We enjoyed flying through the day watching multiple movies: Last Night, Bridesmaids and Water for Elephants for me; Pirates of the Caribbean 4, Battle Los Angeles, Source Code, and half of Hanna for him. Arriving in Orlando after a long time travelling, and having to set our watches back five hours, we were fairly tired. We went to the Mears transport counter to utilise the prepaid transfer vouchers, but there was quite a long wait before our shuttle arrived. During the shuttle trip, there was a radio station 97.5 playing a song “Give me a red neck girl” as part of its country repertoire. We thought that was bad until the return trip when that guy tuned it to a whingeing talkback station, which I hate at the best of times. Then we were the last ones dropped off, and at the wrong hotel. Apparently there is a Marriott Fairfield Inn in Vineland Road and another in Vineland Ave, miles apart. Unfortunately we had wanted the one closest to Universal Studios, as Harry Potter World was the reason we were there, with Disney as a possible side trip. Oh well, these things happen when travelling, and it could always be worse. We were so tired after we checked in that we were happy to just go downstairs to a food court in Marriott Village and buy pizza. They looked at us oddly when we requested a meatlover’s pizza with barbecue sauce on the base. Apparently this is an Australian thing. The generously topped pizza, accompanied by duty-free bourbon was delicious. We enjoyed watching some TV, the US Open was playing, and we thought Roger Federer was looking younger. It turned out there was rain and this was a replay of the match in 2009! Australia doesn’t seem quite as vast as it did when we were in Europe. 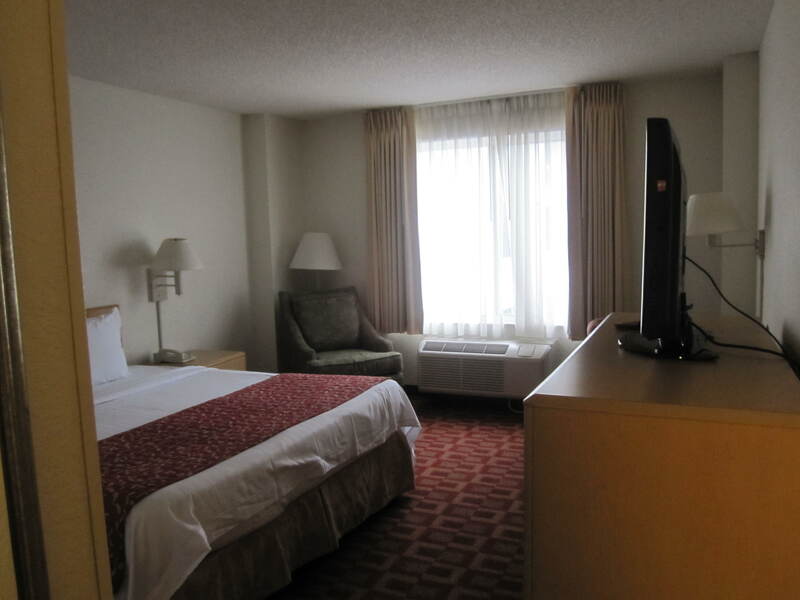 We settled into an extremely large hotel room, bigger than many apartments we have stayed in, with a king-sized bed, a large bathroom, and a television bigger than ours at home. The television screen appeared even larger after having become accustomed to the mini-screens on the plane! I remember when I first travelled to USA in 1981, I was amazed at how people seemed to be either really large or excessively trim and fit. Now that Australia is up there in the obesity stakes per capita, we are more used to seeing very large bodies. You can buy double sized bottles of wine here too, which is almost unheard of, apart from a magnum of champagne, with which we are familiar. One of the first things we noticed when we came down for breakfast the first morning was a plethora of plastic and polystyrene. After using real china and cutlery in all the rest of our travels, here it is all disposable. In France and England recycling was in the forefront, but not here. It seems so wasteful, and I can just imagine the enormous landfill in this country. Vast as it is, it will still eventually run out. And I understand the vast number of travellers there would be in a tourist destination such as this, but is that a good reason for all this waste? Added to the general waste, is the washing. In hotels in Europe and Australia, there are always signs in hotel bathrooms suggesting that you only put towels on the floor that you want washed. Here they not only provide extra towels (which I do like because I need a second towel if I am washing my hair), but there are no environmental notifications anywhere. A toasted cinnamon and raisin bagel with cream cheese, sliced banana and a little Knott’s strawberry jam hit the spot. Our coffee cups from France were useful here, as we prefer drinking from real cups rather than polystyrene. You could add some UHT hazelnut milk which added another dimension to the coffee. At least it wasn’t the powdered coffee creamer. Waffling on: not what I’m doing! You can make your own waffles here, but they beep when ready, and it sounds like an episode from ER with somebody flat lining. I keep expecting one of the doctors to yell out “clear” to be ready to resuscitate someone or something. Although there was no cooked breakfast available, you could take a hard-boiled egg and warm it up in a cup with hot water. Teamed with some toast and butter, this was quite tasty. There were also muffins, cereal and yoghurt available. This entry was posted in Uncategorized and tagged hotel, Orlando, pizza. Bookmark the permalink.